Tone: The accumulated effect of style, coloration, and texture. Like atmosphere in a short story or like mood in symphonic music, tone in poetry is the result of particular choices which affect the reader’s overall feeling toward a poem. One of those choices is “context.” If a poem is part of a collection of poems, the poems often work together to set a tone. A few years ago, I started working on a group of poems based on the concept of self-portraiture. Each poem was titled “Self Portrait: [here I would name the speaker of the poem]. It was a fun exercise. I wrote what I thought were credible (if not true) assessments of myself through that person’s eyes. I tried to pick people who know me well, and also people who only know me in a certain context (for example, “The Doctor”). 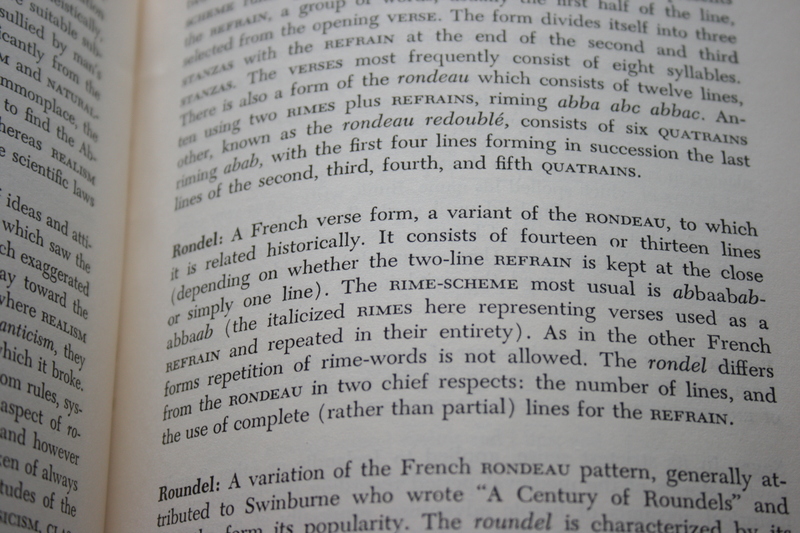 Rondel: A simple song, usually in strict stanzaic form (see STANZA), using REFRAIN, RHYME and METER. Unfortunately, and, some might argue, unforgivably, Packard does not describe the stanzaic form (or rhyme scheme or meter) in any detail. 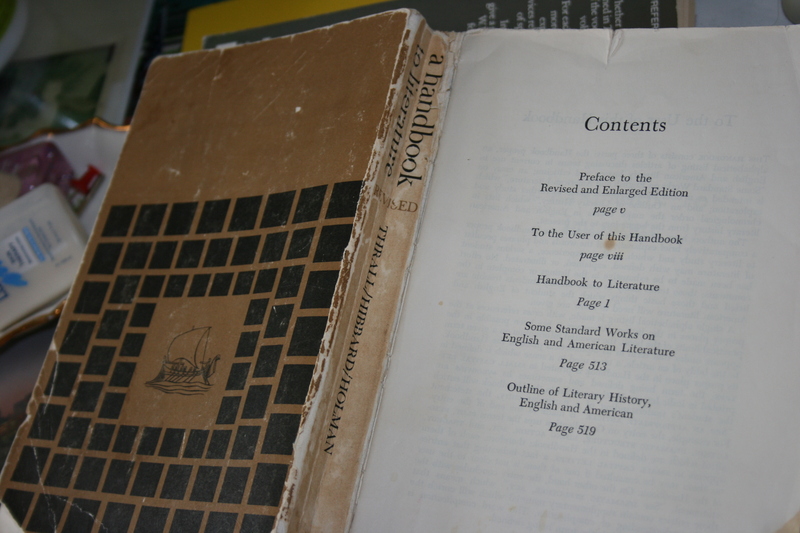 I, therefore, had to call in the big guns of Thrall, Hibbard and Holman and consult with my centuries-old A Handbook to Literature (see photo) (I really do have to get the updated version – it’s an essential tool). Prose Poetry: Poetry having a high incidence of sight and sound and voice devices, but with no formal line arrangements; prose poems resemble loose paragraphs and are sometimes called vignettes. So many, many, many poets do prose poetry well. I am not one of them. Still, this is what I signed on for, so we shall suffer together, dear readers.